David Einhorn, founder and CEO of hedge fund Greenlight Capital, raised $659,730 for the Michael J. Fox Foundation for Parkinson's Research by finishing 18th in the World Series of Poker's main event. After jumping to third place during the tournament he said, "I'm playing for charity," shocking his fellow players. "The Michael J. Fox Foundation. Anything I win goes to that. My grandfather had Parkinson's." Einhorn sits on the foundation's board. LAS VEGAS -- Former Hollywood talent agent Jamie Gold kept his lead yesterday at the World Series of Poker, wiping out two players in the space of an hour and amassing a chip stack almost twice the size of his nearest competitor's. Gold, a 36-year-old Malibu, Calif., resident, nearly doubled his stack to 13 million in chips by the end of play. In second was Erik Friberg, a 23-year-old online poker pro from Sweden, with 7.7 million. 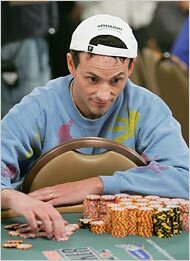 David Einhorn, a 37-year-old hedge fund manager from New York leaped into third with 6.9 million after winning a massive three-way all-in pot. "I'm playing for charity," Einhorn said, as players' jaws dropped around him. "The Michael J. Fox Foundation. Anything I win goes to that. My grandfather had Parkinson's. "I'm on the board of the charity, and Michael said if I make it to the final table, he'll fly out."